Here’s a new one for the coincidences-leading-to-cool-ideas file: Who would have guessed that stacking up old journals in someone’s office could inspire a new field of research! For my latest Skeptically Speaking episode, I spoke with applied mathematician Samuel Arbesman about his book The Half-Life of Facts: Why Everything We Know Has an Expiration Date. He filled me in on the many ways that mathematical modeling can be used to better understand scientific knowledge, from predicting how the number of scientific studies will grow to how quickly different types of knowledge are overturned or modified. One of the fields that is most concerned with these questions, scientometrics, got some of its first inspiration when Derek J. de Solla Price was asked to store some journals on the floor in his office. The library at Raffles College (now part of the University of Singapore) was undergoing renovations and they sent various volumes out to staff offices for safe keeping. De Solla Price wound up with the Philosophical Transactions of the Royal Society from 1665 to 1850 stacked up in piles on his floor. The piles looked suspiciously like an exponential growth curve, and he was struck with a great idea. During our interview, Samuel shared many more stories like this of unexpected patterns that are found in everything from operas to how cities grow. Continuing on that theme I also chatted with Mark Daley from the Brain and Mind Institute at Western University. Mark is a professor of both computer science and biology (and a musician and composer!). He uses computational modeling to understand the network connections in our brains and how different areas work together on tasks. Much to my delight, he also surprised me with some cool examples of how his work applies to popular music, but I’ll let you check out the episode to hear more about that one. Math is a tool for helping you understand the world. It’s by far not the only one, but it’s a very useful one, a profitable one. So when kids ask “Why should I learn math?” — because it gives you power to understand your world, to model your world and maybe even to predict your world. After our discussion about using dry ice with 8 year olds had died down, this year’s crop of space camp counsellors asked a question that plagues almost everyone who teaches, writes about or in any way works to share scientific information: what are the right words to use to explain difficult concepts? Questions like that come up every year in my undergrad science ed classes and in almost every science communication workshop I’ve ever attended. And they’re hard questions to answer. The answers always depends on exactly who the audience is and on the purpose of the article, video or lesson. But the message often boils down to: Scientists and science communicators of all kinds need to cut the jargon and explain things simply. Due to what is starting to feel like an overwhelming teaching schedule*, I didn’t get a chance to properly share how excited I was to chat in December with Sean Carroll about his book “The Particle at the End of Universe: How the Hunt for the Higgs Boson Leads Us to the Edge of a New World.” Sean is not only a top-notch physicist, but a passionate storyteller and communicator. I’ve wanted to interview him since I heard him speak at the 2011 Science Writers conference in Flagstaff. As a former high school physics teacher, I was in awe of how he moved effortlessly from the simplest to the grandest ideas in physics and not only held the audience’s attention but challenged us to think. So getting an hour to talk to him about Higgs Boson was a pure treat. The Higgs Boson surprised the smart money and seems to have shown itself in July, even sooner than expected, in the sensors at the Large Hadron Collider. “They had their own timeline, as the universe often does,” Sean laughed when I asked him how he managed to write this fascinating and highly readable book about the LHC, the history of the Higgs Boson, and –more challengingly–quantum field theory in the same year as its discovery. The conversation was great fun and I won’t lie, I may have blushed a little in the booth when he complemented me on having read the book in depth and asking interesting questions about it. Coming from someone who’s previous two interviews were with the Colbert Report (sorry fellow Canadians) and the iconic Canadian science program Quirks and Quarks, it was my pleasure. You can check it out at Skeptically Speaking. *Shout-out here though to my great students in EDSE 401 Digital Media in Science Education and EDSE 451 Physical Sciences Curriculum and Pedagogy. Aside from scheduling, I’m not complaining at all! Why is it so hard to give up on hoping that facts speak for themselves? Where are the Canadian media in analysing the Death of Evidence protest? On Prince Edward Island for vacation this week, this view is everywhere. Rows of potatoes maturing in the early summer sun. Those rows look pretty perfect, though. And I’d have trouble drawing concentric curves, let alone driving a massive piece of farm equipment to get it just right. The answer? GPS. 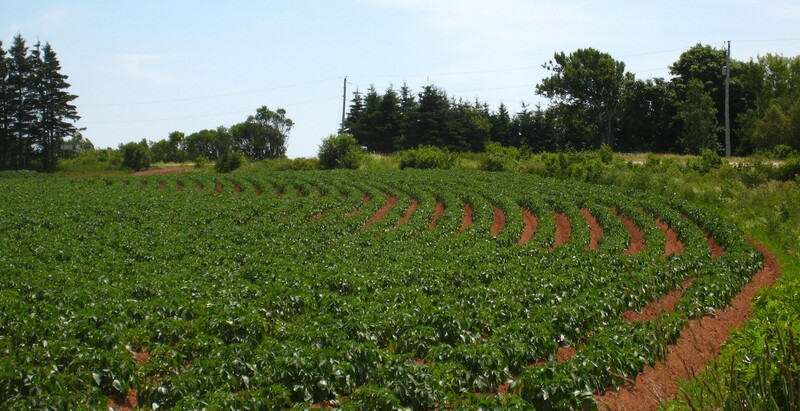 While I’m told there’s debate about its cost effectiveness, planting potatoes is just one of many tasks that has been automated with precision GPS tracking. It caught my attention because I’d just read Scott Huler‘s On the Grid in preparation to interview him on Skeptically Speaking. The book is a thoughtful look at infrastructure systems in the city of Raleigh, and it surprised me in detailing the important role of GPS in planning of all kinds. It’s way more than a tool for lost drivers! (Okay, I knew that but didn’t know much about the specific uses). In one chapter Scott takes us on a surveyor’s tour of an in-progress housing development where GPS drives the bulldozers and takes the place of most of the stakes that would have marked the curbs, road boundaries, and water, power and sewer lines. Thanks to Scott I’ve also stood in parking lots wondering about transitions from asphalt to concrete, looked more carefully at storm drains that I ever imagined and started paying attention to urban streams. For this week’s episode of Skeptically Speaking I had the chance to ask him all about the book, which he describes as his “love letter to engineers and taxes.” Given my own background, I couldn’t help but think that engineers are much deserving of the love. Along with Scott, I chatted with Tim DeChant, an environmental journalist who writes the density-themed blog Per Square Mile. Tim has done some fascinating writing about urban trees (who knew that cities might actually have a net positive effect on tree population in some areas?) and relationships between wealth and urban green spaces. You can listen to the episode or download the podcast from the Skeptically Speaking website.